Ask a moving company about its history and staff. It’s fine to ask how long they’ve been in business, about the crew that will be moving your belongings and if they are employed by the company or are they temporary help. Is the company licensed, insured and certified? Ask the company to do an on-site, in-person estimate and get the details in a written quotation. How do the movers charge and what factors make up the cost of the move? Are there any items not on the estimate that may get added later? Long distance charges are based on weight and distance as determined by the 400-N interstate tariff. We will do a survey so check that all items to be moved are on the Estimate of Cost list to avoid additional charges. International Moves are based on volume and destination and include many more charges and fees from different stages of the move (example: customs clearance, destination ports fees, port storage and more). Make sure you get a comprehensive quote with all charges included from your shipper. Remember – know the laws in your destination country about import duties as this will not be included in the quote and is your responsibility. For more details on how Isaac’s quotes international moves and what is included – click here. Every local move has travel time. Travel time has two components. First, it is the time it takes us to drive from our office to the pick-up location. Second, it is the time it takes us to drive back to our office when the job is complete. These two components add up to the total travel time charge (note that the time to drive from your old location to your new location is not travel time, but rather part of the move). Most movers have insurance but it may not cover the value of your goods. Check, they should be able to provide a detailed and satisfactory answer AND recommend if you need additional insurance. For more info – click here. You never want to pay for a move in full up-front or provide a large deposit. You should only pay in full once your items have been safely delivered and accounted for. If you notice something missing or damaged, make sure you verify that in the mover’s presence. Take a picture, get them to document it. Make sure you know what forms of payment they accept to avoid unpleasant situations. Does the quote include all extra charges? For example – flight charges (steps), long carry charges, appliance charges, parking charges, storage charges, fuel charges, awkward objects, etc. If you have any unusually large, heavy, or otherwise unique items, you should let them know right up front. Ask them if they have equipment to help with heavy and awkward items. For any local move we have a 2-hour minimum charge. This means that any move that is less than two hours (including travel time) will incur the minimum two-hour fee. 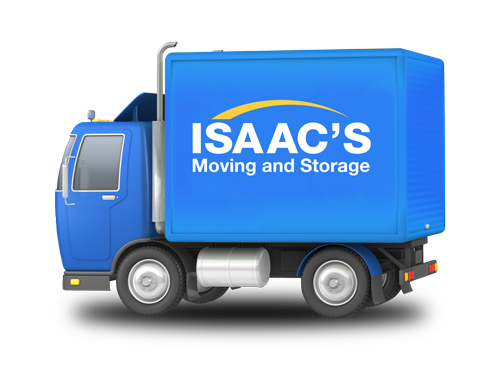 At Isaac’s, our only charges in addition to the hourly rates are for boxes and packing materials we supply you before or during the move. Note that for a local move a mover will customarily charge the customer for the actual hours worked (no matter what the original estimate was). For this reason, you should always be cautious of underestimated moving times and you should never choose a mover based solely on the number of hours estimated. Underestimating moves is a common ploy of movers to capitalize on the “wishful thinking” of consumers. It often leads to disappointment, frustration, and regret on the part of the customer when the move exceeds the estimated hours. Ask if the moving company has restrictions on what it will transport. Some items are not allowed to be transported in their truck or over state lines. We always recommend homeowners pack and transport valuables, sentimental items, jewelry, medications and weapons on their own. In general, moving companies do not accept liability for safe transport of plants, and additionally, some states have rules about transporting certain plants. Check with a consultant at Isaac’s to see if your plants can be a part of the move.